When social media networks monetize, advertising is the fastest and easiest way to start making money. In the cases of Facebook, Twitter and LinkedIn, the money made from those ads goes straight to the companies bottom line. Tsu says their model will be the complete opposite wherein they will pay 90% of that ad revenue to the owner of the content (you) and only keep 10% for themselves. 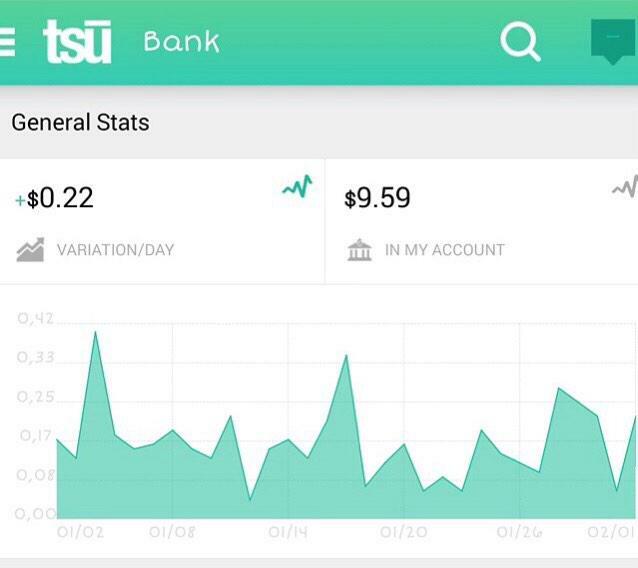 When you first join Tsu you normally don’t see your bank changing for at least 36 hours or so. So be patient. I have a lot of people asking me how I make so much money on Tsu. It is simple and you can do it too. The main thing is to be active on Tsu. If you don’t post anything your not going to make anything. So try to post at least a few times per day. Another thing that helps is to get a lot of followers. I have over 1400 and it is easy to get that many. Just follow the limit of 1000 people. Most of them will eventually follow you back within a few days. The more followers or even friends that you have the more views you are more likely to get on your posts. The more traffic you are getting the more it will increase your revenue so that is an important aspect of earning on Tsu. Another thing that you really need to focus on is inviting people to join under you. You make a percentage off of what they make when they are active. So the more people you invite and the more people that they invite and so on and so fourth the more money you are going to make. Yesterday I made .77 and had something like 30 invites or “Children” Today I have 33. So we will see what I make tomorrow. The key is to blow up your network with information about Tsu and encourage others to join.